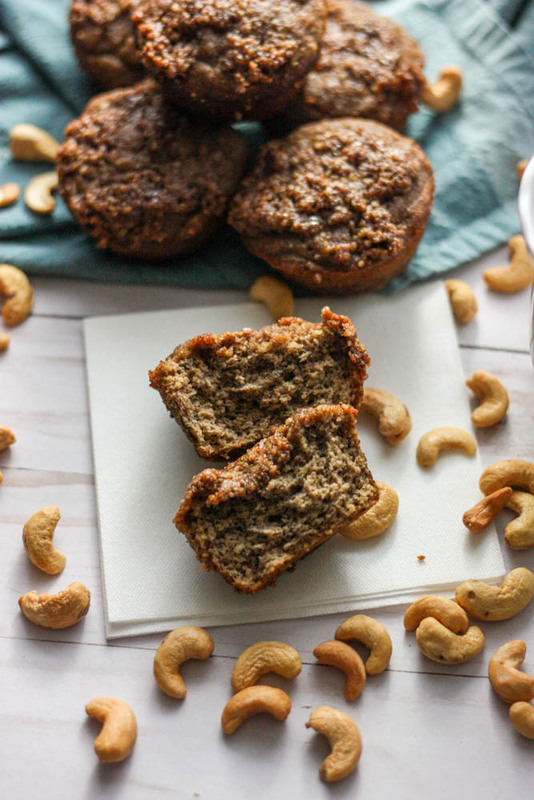 These Paleo Cinnamon Streusel Banana Muffins are the thing your breakfast table needs. A healthy, moist, and protein filled treat. This post has been sponsored by Sunshine Nut Company. As always, all opinions remain my own and I’m so proud to partner with brands I trust and personally consume. Thanks for supporting the growth of Miss Allie’s Kitchen! I have to admit, the first time I made these muffins, I quite literally threw a party in the kitchen. I really struggle with muffin baking, especially gluten-free and/or paleo versions. They always turn out too dry, they don’t bake and turn to mush, or they deflate after they come out of the oven. So, these bad boys came out of the oven and were utter perfection. I snapped some photos and J and I scarfed them down in 2 days. When I went to upload the photos to put them into this post, I was like… oh heck no. The photos didn’t do them justice. Not my best work. So I “reluctantly” made them again, but this time I waited until J was out of town so I could eat the ENTIRE batch myself. Mwahahaha. Diabolical, really. To clarify, this is a small batch muffin recipe. It makes about 6 muffins, which is more than we need. I often feel like I want to bake, but know we don’t need to overload on treats, or I know we won’t eat them all. 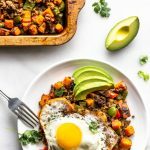 If you’re a smaller family, this recipe will be perfect for you. Or, you can easily double it for a full dozen. 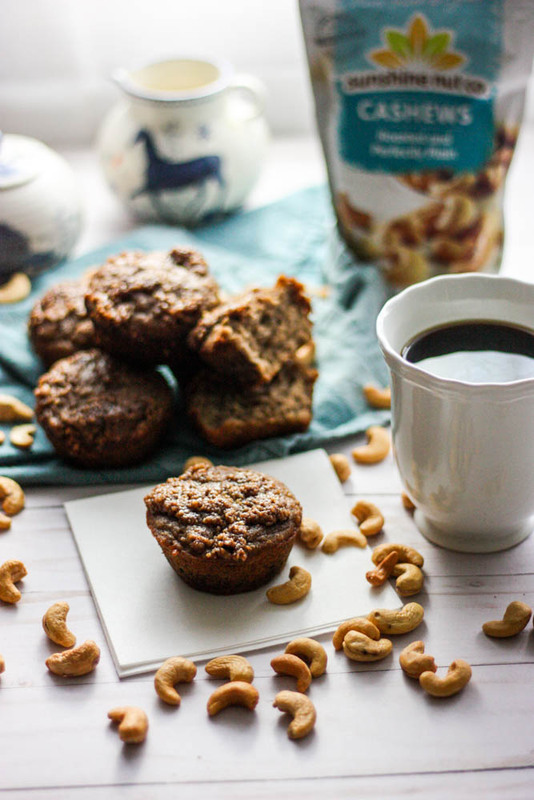 These are the perfect healthier breakfast treat to make this Thanksgiving week. They’re a quick grab-and-go, but they’re also divine enough to serve to guests in town. 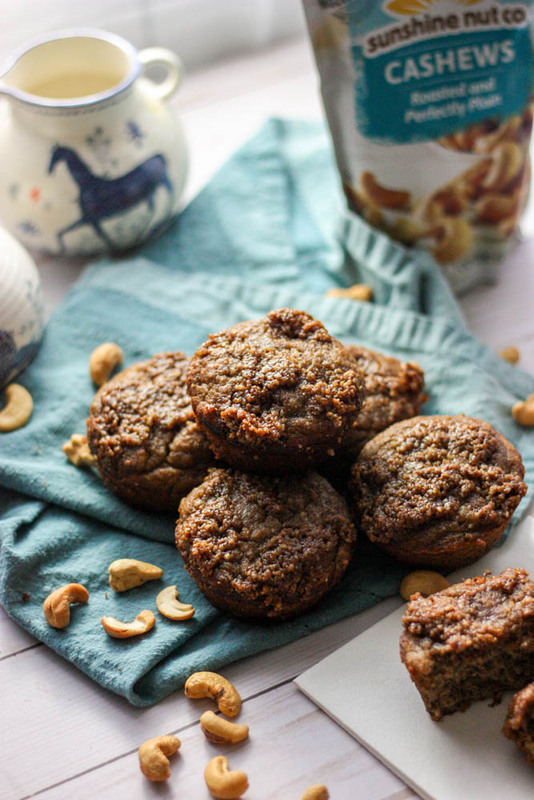 These muffins are paleo, so they’re actually made out of ground cashews. 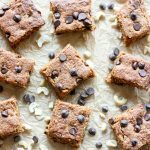 If you haven’t noticed, cashews are my favorite nut to bake with because they are just SO darn buttery. 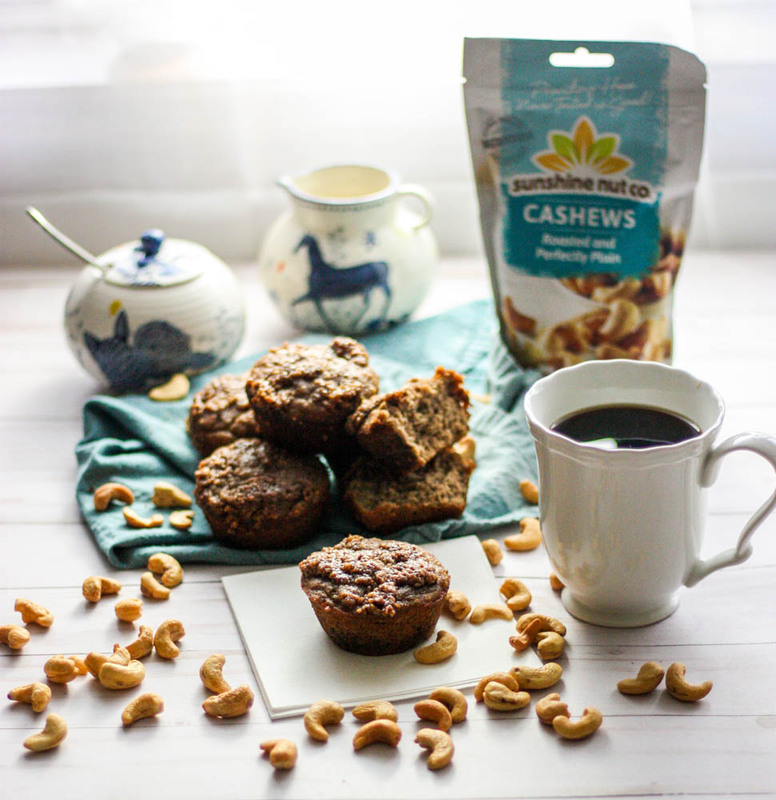 I used Sunshine Nut Company’s Perfect Plain Cashews, which do the trick every time. I buy them at my local grocery store, but if you’re an online shopper, they’re having a 50% off sale online this week in honor of National Cashew Day. 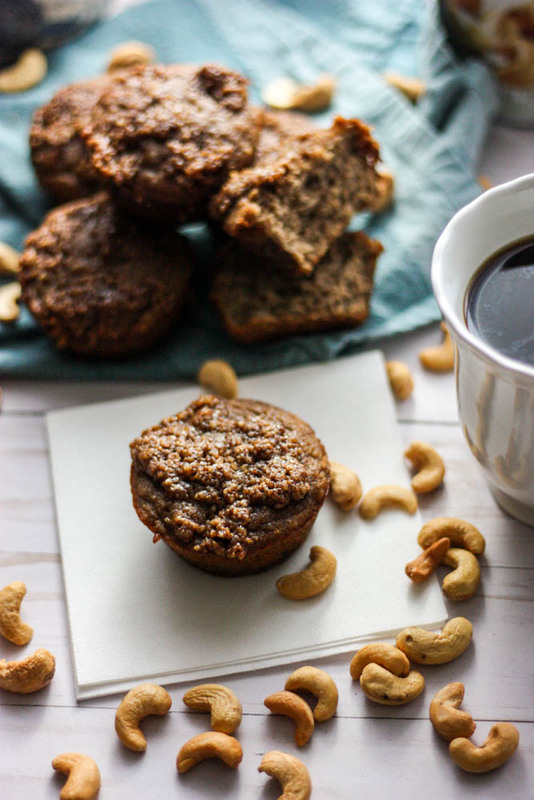 The muffins have a small amount of coconut sugar in them, but the majority of the sweet comes from the really ripe bananas, so heck yea to all of the plant based things! Preheat the oven to 350 degrees. Grease a muffin tin well or place muffin liners inside 6 of the wells. To make the cashews into meal, place about 1/3 cup of cashews into a blender or food processor and process until you have fine crumbs. Mash the bananas in a bowl and add 1/4 cup melted butter, almond butter, 1/4 cup of coconut sugar, vanilla, and eggs. Stir everything together well. 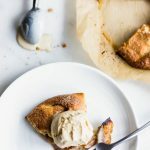 In a separate bowl, whisk together the cashew flour, coconut flour, baking powder, baking soda, 1 teaspoon of the cinnamon, nutmeg and sea salt. Pour this dry mixture into the wet and mix until everything is incorporated. Pour the batter evenly into the muffin tin, filling about 6 of the wells 2/3 of the way full. Before placing them into the oven, make the crumble topping. Combine the reaming 1/2 Tablespoon of softened butter, remaining Tablespoon of coconut sugar, and the remaining teaspoon of cinnamon. Sprinkle over the muffins evenly. Bake for 22-26 minutes, or until the muffins look set and a toothpick comes out dry. Let them cool on a wire rack before gobbling up! 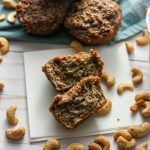 this recipe has also been tested with coconut oil in place of butter and it works well!